Play To Win A Free T-Shirt & Possibly Win A Washer & Dryer - Starts At 8 AM CST Today 7/18 | A Savings WOW! “Like” ERA Detergent’s Facebook page and play their Stain Kicker game for a chance to win a washer and dryer. If you are one of the first 200 to play starting at 8 AM CST today, July 18th, you can also win a free T-shirt. If you win, you will be asked for your T-shirt size. Hurry, though, as these T-shirts will probably go fast! While you are on Facebook, don’t forget to check out A Savings WOW’s page also. 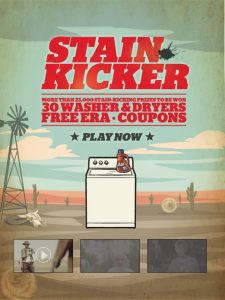 Click here to play ERA Detergent’s Stain Kicker game.